A black coral polyp. Photo courtesy of Dr. Erik Cordes (ECOGIG). The management and conservation of deepwater (deeper than 50 m) coral communities requires scientists to understand how the coral populations are connected in environments that are challenging to observe due to their depth. Connectivity between populations influences gene flow among coral colonies, their evolution and genetic diversity, and contributes to their ability to adapt to natural and human caused stresses. For example, in the event of a localized stress event, well-connected populations can deliver larval recruits to disturbed communities and help them recover faster. However, the scale that deepwater coral populations exchange larvae has been difficult to predict, complicating researcher's understanding of impact and recovery of those communities from disturbance events. 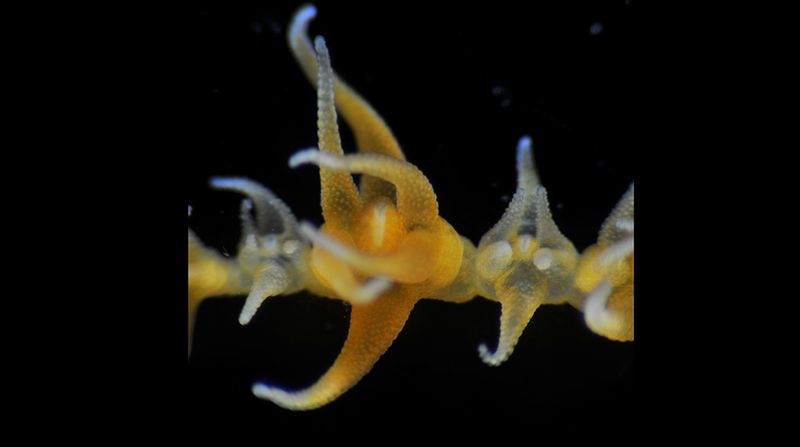 The black coral Leiopathes glaberrima is a foundation species of deep-sea benthic communities but little is known of the longevity of its larvae and the timing of spawning due to the deepwater habitats it lives in. In a recent ECOGIG paper published in the journal PLoS One, the potential connectivity of L. glaberrima in the northern Gulf of Mexico was investigated using both genetic and physical dispersal models. The genetic analysis focused on data collected at four sites to the east and west of Mississippi Canyon in the Gulf of Mexico and revealed low but detectable connectivity over 10,000 generations of corals. The physical dispersal model simulated the circulation in the northern Gulf at a 1km horizontal resolution; virtual larvae were "released" 12 times over the course of 3 years and followed over intervals of 40 days. Connectivity between sites to the east and west of the canyon was low due to the complex bathymetry, differences in mean circulation to the east and west of the Mississippi Canyon, and by flow instabilities at scales of a few kilometers. The findings of this paper suggest that dispersal among sites is limited and any recovery in the event of a large stress event, such as the 2010 Deepwater Horizon accident, will depend on local larvae produced by surviving individuals. To read more, you can access the entire paper "Potential connectivity of coldwater black coral communities in the northern Gulf of Mexico" online here.